and a terrible secret could decide the fate of a country. BOSTON (June 2, 2016) – Filmmaker Christian Lindstrom returns to Vietnam to shoot tourism commercials, only to confront the agony of his past and the power of the Asian underworld to control political events—including the creation and the whitewashing of Japan’s history itself. For producer Nachi Tanaka, it is the story of the shameful sins of the father coming back to hurt and haunt her family generations later. For the Japanese government, it is a coup d’état engineered by powerful business interests with the Japanese mafia—the yakuza—doing their murderous bidding. 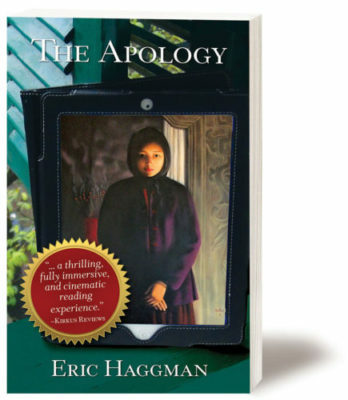 The Apology is author Eric Haggman’s first book which he scrupulously researched during two month-long trips to Asia—visiting Vietnam and Japan. The Apology was inspired by these world travels, Haggman’s passion for political conspiracy theories and in particular the inner workings of the criminal underworld, as well as thrillers by his favorite writers including James Lee Burke, Stieg Larsson and James Patterson. While researching The Apology, Haggman even met and interviewed a yakuza member to better understand this incredibly powerful mafia group openly operating in Japan today. Haggman also shares professional interests with Christian Lindstrom. He is the CEO and Creative Director of Haggman Advertising, which he founded. His work has been cited for excellence over 200 times by nearly every major advertising award show in the country. Haggman drew on his own experiences in advertising and making commercials to create film producer Lindstrom—a character who is incredibly compelling, believable and sympathetic. A Milwaukee, Wisconsin native, Eric graduated from Colgate University. He lives on the North Shore of Boston, with his wife, Emily and their Ragdoll cat, Shanghai, who thinks he’s a dog. Eric Haggman, The Apology, June 2016. Watch The Apology social media trailer here.